An imaginative and fact-filled book for inquisitive children. A picture book with several parallel levels. Big and small, vehicle and animal, they are examined in the way a child might do. Here is lots to discover, just like on a real walk. 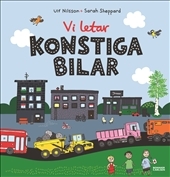 Experience and study the town together with Ulf Nilsson and Sarah Sheppard! Three children from the day nursery are walking with their teacher to the library. Josephine, Simon and Tiny. Lots of fun things happen. A dustbin lorry fetches rubbish. They see a slug on the ground. What sort of weird cars are these? A lorry with a concrete mixer that revolves. What are they going to do with all these things? A bus goes past. How many people can travel in a bus? The questions pile up, and right next to them in little information boxes you can find the answers and can learn lots about vehicles, birds and some flowers.